❒ The work of the Italian scientist Amedeo Avogadro complemented the studies of Boyle, Charles, and Gay-Lussac. where n represents the number of moles and k is the proportionality constant. "At constant pressure and temperature, the volume of a gas is directly proportional to the number of moles of the gas present". 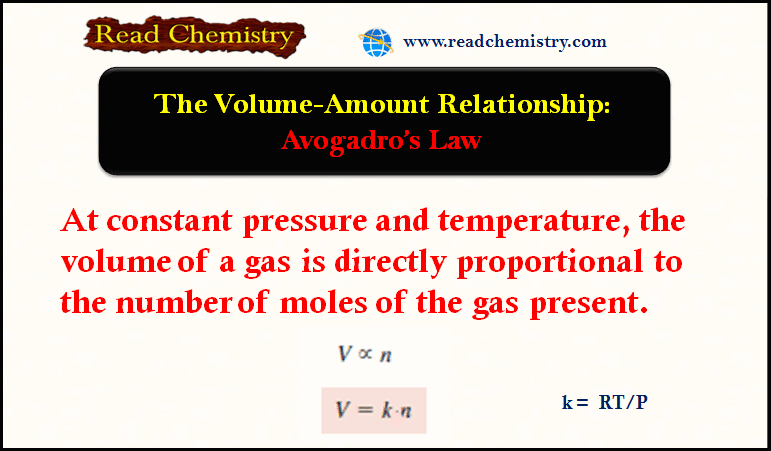 ❒ According to Avogadro’s law we see that when two gases react with each other, their reacting volumes have a simple ratio to each other. If the product is a gas, its volume is related to the volume of the reactants by a simple ratio (a fact demonstrated earlier by Gay-Lussac). Reference:Chemistry / Raymond Chang ,Williams College /(10th edition).